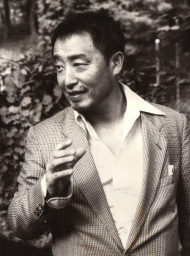 Born in Seoul, South Korea, in 1932, Nam June Paik graduated from the University of Tokyo with a degree in aesthetics and a thesis on Arnold Schoenberg. In 1956, he traveled to West Germany to continue his studies of contemporary music. There he met John Cage, participated in Karlheinz Stockhausen's musical theater piece, Originale, and began to do his own compositions and performances. In 1961, Paik met George Maciunas, founder of Fluxus, the loose network of artists with whom he became associated, as in his early pieces of object art such as Urmusik (1961) and Violin With String (1961). Paik visited the United States in 1964, eventually settling in New York City where he met Charlotte Moorman, a classically trained cellist and a noted interpreter of avant-garde music. Starting with their performances at Moorman's Second Annual New York Avant-Garde Festival, they collaborated often, in such pieces as TV Bra for Living Sculpture (1969) and TV Cello (1971). The following interview with Nam June Paik took place in late September 1982 in Paris, where Paik was drawing plans for his huge installation piece for the Centre Pompidou there (December 1982-April 1983), Tricolor Video, using 380 video monitors. How did you go from first studying and composing music to doing video? I think at that time the life of electronic music was still very primitive, with Stockhausen's studio. I was not making very good electronic music. It was an action kind of thing, happening music. This was 1959-60. Then there was a German artist, K.O. Goetz, who published a couple of essays on electronic painting, computer painting. So I said that's a very interesting idea, but I didn't think it was mine. Then nobody did anything, so I said, then I will do it. Then it was easy, I thought I will do electronic visual art, from electronic audio art. You were in Stockhausen's Originale in the late 1950s. What was your part in it, what interested you about his work? Well, I admired, and still admire, Stockhausen's music very much. He’s a damn good musician. And then, I managed to get into his studio because of my teacher, Wolfgang Fortner, a well-known composer, he arranged for me to get in, which was very important, only five people were there. I hadn't performed yet, but he somehow thought I fit there. So. I was awed by Stockhausen, you know, he’s a big man. Stockhausen lived near me, and then one day I invited him and I did my "Hommage à John Cage," my first performance piece. And he was impressed. So he invited meto do whatever I wanted to do in his piece. I had just written a piece called “A Simple Piece,” so I gave that. Then, of course, more people came to seeme because of Stockhausen. So I profited a lot from that engagement. I owed him a great favor, he helped me in a way as much as John Cage. How did your friendship with Cage start? How has that helped you and influenced you? On the way to Cologne, from Kreigel where I did a study, I stopped at Darmstadt where John Cage came and gave a course. I was turned on by his music at first, I was really turned on by his boring music, you know, boredom. So when I read a recent Time magazine, on Minimal aesthetics, and they wrote about Steve Reich and Philip Glass, Minimal music, and they trace their lineage to LaMonte Young, of course LaMonte Young got started by Cage. Actually, he was also in Stockhausen's course. He was there in the same year. He was kind of remarkable, because they thought he was a real idiot, to make this do-re-mi-fa do-re-mi-fa, this kind of repetitive . . . so in a way he was appreciated as an interesting fool. Then Cage and Tudor picked up with him, a piece called “The Poem,” with the furniture in the piece. Then, next year, 1960, David Tudor brought LaMonte Young's “573 for Hand and Flint,” it's strike anything for 500-some times. A very important year in modern music. But aesthetics of boredom, started by John Cage and Morton Feldman, very important. How did Cage’s ideas affect your own work? I learned from John Cage two things. One is collage technique, sound collage. I was thinking vaguely, but he was very clear. And then the other thing, was the aesthetics of boredom. But the aesthetics of boredom I didn’t apply to my work. Because video is boring anyway (laughs). But it's still important, that somebody can make that boring music. In college you wrote a thesis on Schoenberg. What attracted you to his work? I think that I am a born extremist, you see. I like extremes. Because I heard in Korea in 1946 or 7 that Schoenberg is the most extreme diabolic composer. So, that alone was enough to attract me. Yeah, it’s good that I didn’t become political as well, because then it might be dangerous. You wrote music scores early on, and music seems to play in or around the edges of a certain number of your pieces. But what, for example, is the role of music in a piece like “Violin with String,” where you drag the violin along the ground by a string? It’s almost a non-musical piece. No, but it's a very beautiful sound it makes. You have to buy a good, older violin, not the new kinds made in China. Which violin you play is very important. You don't think it sounds, but when the older, well-carved real violin is being destroyed it is a beautiful sound. For one sound, it’s worth that. So you actually used a good violin? You have to. And good means, there are two ways to make a violin, the old way of carving and the new way of gluing, and that gluing is just no good. Also, when you work with a violin there’s resonance, and then a violin so well-made if you walk on the street with a string, it's just an unbelievable good sound. Very good music. What was the piece exactly? All I’ve seen is the photo of you dragging along the violin. Yeah, yeah. Actually, I made a string quartet where four people do it. So the violin has all the strings on it. Yeah, but that’s not necessary. But I thought four people would make a string quartet. And did theatrical value seem important to the piece? What was the importance of music in the piece “TV Cello,” of 1971? At the world premiere we put Janis Joplin inside, on the TV screens, and Charlotte playing strings and Janis Joplin singing, it was beautiful. I lost that tape. And there’s a different video picture each time there’s a performance? How did being a part of Fluxus help to shape your work? Fluxus taught me a kind of great simplicity. Their music was even simpler than John Cage’s. So, it gave me courage, to be simpler. What for you are the limits of music? When you deal with 50 cycles to 20,000 cycles, it becomes music. When you deal beyond up to 4 million cycles, it’s video. Yeah, it’s very clear. The video cycle includes from 20---actually from 1 cycle---to about 6 million. But one is the ear and one is the eye. Yeah, that’s how television is made, you know. I think sound is time sequence. And then if it contains content, like narratives, then it becomes movie, theater. And if it becomes purely abstract, like string quartet, it’s purely music. And then depending on the ratio of content versus abstract time, there’s many grades between music and theater. The basic difference is whether you close your eyes or not. When good music is listenable, it’s with closed eyes. Then you use only half the brain, which is very enlarged. When you open your eyes, then you’re using both halves to a limited amount. It’s purely narrative, like a newspaper. So, music or not music would be whether a certain amount of time art permits you to close your eyes or not. If music has no power to let you enjoy it without seeing, then it’s not great music. So, for me it’s harder, to write five minutes of good music is a hundred times more difficult than to write five minutes of sound and picture. It’s the same as, in the first case of music writing, trying to go down a small alley with a big Cadillac. The other way, sound and picture together, is like driving a small Volkswagen on an empty highway, you know. It’s easier. So, I respect a great deal the great composers. Were you interested even at the start in trying to write just music? Yeah, my idea was, and maybe even now, to make a great pure sound, but I failed. So I’ve got a certain inferiority complex to composers. I kept saying to Takemitsu that I’m frustrated and a failed composer. He thought I was just being modest. I was being honest! Do you have any plans for upcoming pieces with music? In which I write the music myself? Yeah, I wrote a Symphony No. 6, which was premiered on WDR, one of the German radios. It was my dream, you see (laughs), so I finally made it. It’s a really respected hall in Cologne, when I was young I dreamed to go there once. And what about the other five symphonies? Oh, I have them. I have written about them in Source magazine, from the West Coast, in issue 12 I think. And then, the sixth consists of about 18 strings, maybe 20, I forgot, but with only one bow. So, you make one sound and then you give the bow to the next guy. Like passing joints around. A music promoter said he wants once to hear this music between Mozart and Beethoven (laughs). But the problem is a basic pictorial problem. In some concert halls the audience is higher than the podium, or vice-versa, the eyes have to be higher so you see this. In the future we have to have like television projection, so you can really see. But I’ve got one record out, it’s another piece, which is purely sound. It was simply Schoenberg’s “Verklaerte Nacht,” 78 rpm played in 16. Oh, it was beautiful! I’m really satisfied with it, I couldn’t believe it afterward. And I’m making another record, of all my piano. Prepared piano, but in my way. I played it. We recorded it for CBC radio, Canadian Broadcasting, then we thought it was very good, so we’re looking for an American record producer. It’s with Ray Gallon, who recorded and edited it, so we’re co-producers. With the piano pieces, was there actually notation? There’s no notation. It’s kind of old ideas, and I thought it would be purely musical, that you can listen without opening your eyes. It will not be popular for a long time, but I’m sure it will be appreciated. And what are those pieces called? I’m thinking actually. My first piece was supposed to be a sound piece but it never really made it, “Hommage a John Cage" in 1959. And it was supposed to be the second movement of that piece, this piano work. The first part was more action, but it was never really finished. At that time, it bore the subtitle, “As tedious as possible.” It was quoted by Stockhausen, you know (laughs). Have most of the music pieces you’ve written been from the ’50s and ’60s? That kind of basic process, piano preparation, was done in the ’50s. And the string pieces were ’72. Do ideas from music composition contribute to your concept of nonmusical pieces? Yeah, I mean, the first I got into nonmusical things was from desperation of not being able to make sound pieces. So in that way it was an imagined exit from music. It was not an influence, but it forced me to go there. But has music affected your approach to other work? Yeah. For me, of course, musical study was very important, especially the sonata rondo form. And then, church sonatas. Actually, by chance, in Munich I wrote a report on pre-classical music, at Munich University. I published it. I analyzed about 20 or 30 unpublished symphonies before Haydn, you know, Mannheimer students. And then, I kind of traced the chief experimental works which came out of Haydn. There were a lot of experiments done, like one of the most pointillistic symphonies by Emmanuel Bach I found, it’s almost Webern in tonality. My professor rejected it. Around the turn of the century a book was written by Adler (not the psychologist) on this subject. He made a stylistic history. He wrote not music history, but how to write music history, how to listen to it, you know, he’s Viennese. So, since then, everybody got dominated. Yeah, yeah. And he made it very German. When composers composed, they just wrote the music. But they didn’t write music, you know, to invent the sonata form (laughs). And this first sonata form is maybe the most advanced musical form, still. Has your interest gone to other kinds of music, Eastern, African? Yeah, well you know, we were born in the generation where East was bad, West was great. And then, the charm of consonant harmony, do-re-mi-sol, is so new and so sweet to all Oriental culture. So, Mozart, Beethoven swept like the tide, without even any snobbism, I think. Like democracy, same thing. Democratic ideals swept without being forced. Industrialization, and then Western classical music, church choirs. Have you any interest in jazz, or other kinds of improvised music? Yeah, I was in Donaueschingen in ’57, which had Pierre Boulez when he went into electronic music. And in that concert, there was the Modern Jazz Quartet, in their best year, I think. Oh, it was fantastic! This was really whenI discovered it. And did you start listening to certain musicians in jazz after that? Since then I became indiscriminate. I like to concentrate. And then, I’ve got some televisions, so . . . I’m an extremely lazy guy, so I don’t put records on, and I never had . . . because it costs money to buy records, and they’re impossible to steal. Then I lived with radio, and somehow the radio broke, around 1967. And I had only one record, the Schumann piano concerto, which I like very very much. So, every day I woke up with the Schumann concerto, because at that time we didn’t have any other record. Still I listen to that. My two most favorite pieces are the Schumann piano concerto and then, Chopin’s E-minor piano concerto. And then, Mozart’s symphony No. 14. Those three. So now, my wife, she’s a great artist, but she hates any music. Somehow she made all the composers she’s lived with, I’m the fourth or fifth . . . and she’s forbidden me to play new music, so I cannot listen to new music. How has your ongoing collaboration with Charlotte Moorman contributed to your work? Oh yeah, without Charlotte . . . because I was about to quit music or performance completely, to concentrate on video. Then, I met Charlotte and she excited me very much, so I wrote many pieces for her. And actually I continued the performance career because of her, without her I would have stopped. So, she let me continue, forced me to. Two practical reasons. By then, I was very very busy, making a living and whatnot. So, I was spending most of the time on video. And I have been sick all my life, so being sick is part of my life. You know, once a week to the doctor, and then thinking there in the waiting room, so . . . But any activity Charlotte Moorman brings, there’s alot of publicity. Only she doesn’t like too much rehearsal, so it has to be simple to perform, simple to rehearse, and very fast to write. So, I generally take very cliché classical music and put some salt and pepper in. It was the fastest and maybe “bestest” (laughs) way. Sometimes I make small intricate notations, but generally speaking I write very fast solutions. When you say that you’ve been sick all your life, have you incorporated that ever into any of your pieces? I want to do a Chopin biography on video, because Chopin was always sick, and also had a very strong wife. And then also, Chopin was from a small country which was always in turmoil, and so I want to incorporate all those. And the locations, in Mallorca, here, the Place Vendome. Yeah, but always when . . . the French Revolution comes, I use May ’68 news, and when the Warsaw Uprising comes, I use Walesa, the Solidarity news. So, basically the situation in Poland at least, more than in middle Europe, hardly changed since then. The Germans became stronger, that’s the only difference. Is this something you think will happen? Yeah, slowly. I have a lady artist in Boston, Betsy Connors, who may animate it. I’ll use all techniques. We hope to do it in the next five years. Do you have a sense of how audiences see and hear your work differently in different places? Does that seem to affect it? Yeah, that’s an interesting question. Americans are more sophisticated in television perception, because they’re trained by commercials and things in the street. Generally in my videotapes I jam a lot of information, and Americans perceive it faster, more than Europeans, because of the training. I have a tape called “Olympic Tape,” which has rock & roll on the soundtrack, and very sophisticated, complicated visual happenings. In Germany it’s not that popular because they think, Ah, it’s just a rock & roll tape. But Americans, people look beyond the rock & roll, at the images. So, I think they are different. What about the differences for the performance work? I think Americans are more . . . think performance an extension of party. And then some Germans or Italians think of it more like an extension of revolution. Italians think that’s the artistic response to the May ’68 revolutions. Well, Japan, they are very far, so they have to study to survive. Everything is that, Cage or Stockhausen or . . . And they generally don’t take you until you are really established. Then they invite and wine and dine you, they give a real star treatment. And then they never invite you back, I mean hardly. They have to look at you, they look very carefully, only the first-class brand. And they have a fantastic eye for that. So, they don’t applaud too much, you know, they’re just trying to understand. Yeah, they’re far away, and they know. Because they have been more or less far away from cultural centers, from China and India, where the predominant influence was. And now it’s Europe and America. It’s the same thing for Marxists, what’s written is very carefully studied, very well. They may have the best Marxist scholars, they’re quite studious. Lastly, I want to ask about one of my favorite pieces in the New York retrospective this spring, “Candle TV,” a very simple piece, the shell of the TV with a lit candle inside it. What brought the piece about? Yeah, many people like that. That’s from desperation tomake a living. I couldn’t se1l my pieces, not because collectors were stupid, I had enough journalistic support, and fairly good galleries, you know. The reason is that in Marxist terms my work didn’t satisfy the material base of art collectors’ relationships. Because generally speaking, the collectors who set prices in America, they are kind of New York Upper East Side, middle-rich. Not old rich, who would have mansions, they buy old art. So, although they have some cash flow, they don’t have big apartments. The limit of the apartment is where they stop buying. So, with the same space they would be giving me, with all the big TV sets, with that space they can buy five or ten Frank Stella, which they can double the price easy. So, I couldn’t sell any. And then with the TVs, they break down, and they’re expensive to fix. So I needed something unbreakable. And I took a candle, a candle is unbreakable. You just put in a new one. But it’s a piece that lets the imagination go in a different way. Well, imagination comes from necessity.